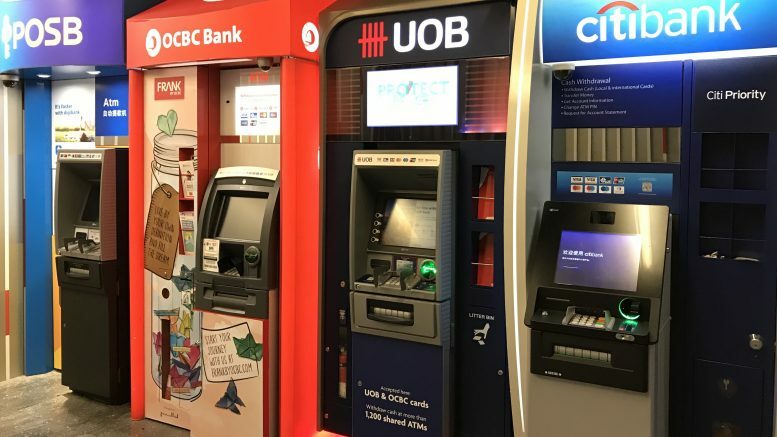 POSB, OCBC, UOB and Citibank ATMs in Singapore. “Trade war noise” brought Singapore banks’ share valuations down, providing an opportunity to accumulate them, Nomura said in a note on Monday, pointing to three reasons to keep buying the stocks. The Monetary Authority of Singapore tightened policy for the first time in six years, signalling confidence in the macro-economy, Nomura said. It noted Singapore’s advance gross domestic product (GDP) estimate for the first quarter showed 4.3 percent on-year growth, with the MAS expecting firm global demand this year. Nomura said it raised its 2018 Singapore GDP growth forecast to 3.0 percent from 2.5 percent. “This should support a stronger loans growth narrative for the Singapore banks. Our loans growth estimate for 2018 on average for the Singapore banks are at 7.9 percent (vs consensus of 6.2 percent),” the note said. Singapore banks’ wealth management assets under management (AUM) has been outgrowing its peers on average last year, Nomura noted, citing Asian Private Banker’s Asia league table published earlier this month. It forecast average wealth management fees to grow 29.7 percent in 2018, to make up 8.9 percent of total revenue, up from 7.7 percent in 2017. Nomura rates DBS and UOB at Buy and OCBC at Neutral.